The Costa Vasca runs the length of the Basque Country and as far as Biarritz in France, though here we are limiting our interest to the Spanish portion from Bilbao to beyond San Sebastian. Away from the industrial area of Bilbao you will find small coves, long sweeping bays of golden sand, and dramatic rock formations. Some of these beaches are popular with surfers or body boarders due to the strong waves coming in from the Bay of Biscay. This area of northern Spain is known for it's cuisine (it is said that the restaurants of San Sebastian have more Michelin stars per head of population than Paris) with shell fish and other seafoods being specialities. 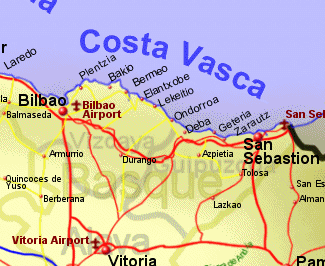 The Costa Vasco is serviced by Bilbao airport, and San Sebastian airport or via the ferries to Santander and Bilbao.